Final Fantasy XV New Game + is up and running with the latest 1.03 patch. You can start it from the main game menu, just before you load the save. Starting New Game + will overwrite both of your auto save slots. Before you choose NG+, back up the latest save on a different slot, just to be sure. New Game + doesn’t overwrite hard saves if you don’t want it to. 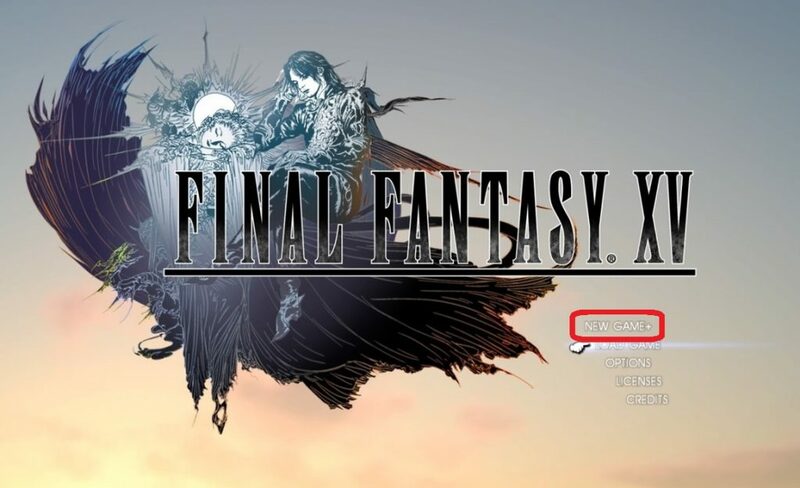 If you’re interested in all the changes this update made to the game, check out the FFXV patch 1.03 changelog. Almost all Regalia customization choices. The Type-F Flying Regalia remains locked. With all these things remaining the same, you might wonder what will be different. There are a couple of things – some of them are not that big of a deal, but others can be a bit of a pain. When you start New Game +, the map resets. This means that each POI you’ve discovered is now hidden, waiting to be found again. With the POIs gone, the parking and other fast travel points are gone as well. You can’t fast travel to an undiscovered area. As you might remember from the first playthrough, you could not go to Duscae and Cleigne at first. This is the case once again. You need to complete the appropriate chapters to be able to go there. No chocobos at the start. Engine Blade and Regalia return to their first, unaltered forms. Hunter rank resets. If you want to raise it, you’ll have to grind through all the hunt quests once again. A lot of people associate the term New Game + with stronger enemies and more challenging gameplay. This is not the case with this one, at least not for the time being. The enemies remain on the same level, although you’ll be more powerful. Fights end with you killing them instantly. If you haven’t already gained enough AP through this one short AP farming method, you will now. Although the patch that added New Game + also added various bug fixes, it didn’t fix the most awesome one. This is of course the one that allows you to have an additional party member – Aranea. If you have her in your company, thanks to a glitch described in our how to get Aranea guide, she will remain with you in New Game + as well. The unique, upgradeable weapons can now be sold, since they’re no longer so unique. Keep this in mind, or you might accidentally sell a great item for pocket change. Or just avoid selling items altogether. Someone may ask if there are new, “plus” items. It is highly unlikely that there will be specific New Game + items. It feels like this is just a story reset. But, on the bright side, you can get duplicates of all your previous weapons. You can now give the best weapons not only to Noctis, but also to his companions. TL/DR: Almost everything from the regular game transfers to New Game +. Everything but the upgraded Engine Blade, the Flying Regalia and hunter ranks. New Game +, in its current state, only resets the story and POIs. There is no Hard Mode. Mine will not load at all. When I select new game+ it gives me the option to select a save slot, but won’t let me select one. I tried creating a new save file from my last save point, still no bueno. Any ideas? I’m getting annoyed. I’m having this same problem. Did you end up resolving it and if so how? I still have my engine blade upgrades, and the chocobos. Slightly wrong info I assume. Ultima Blade is still here but you get another engine blade. wether its a common bug or not at the moment but the when i carried over to new game + i still had a lv 3 engine blade plus a new one at lv 1 i even restared a few times to see if it was just a glitch but no every time i reset i still had it. Same Xbox unable to load my save file that is in chapter 15. Also both auto saves don’t work.